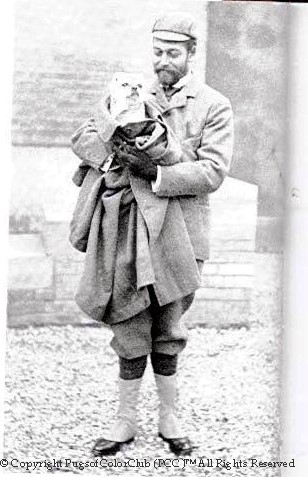 I know most people are aware of Mr Pickles, Johnathan Ross’s black pug but how many know King George V had a very handsome prince of a pug. 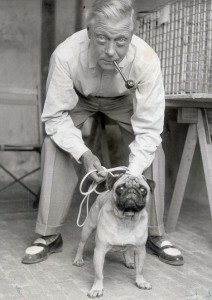 The expression on the King’s face says it all, he is looking at his pug and thinking my pug is just such great company and I can’t help but smile every time I pick him up. Pugs like being carried, which is a very endearing trait of the pug. You will have to research very hard to find another picture of the King looking so relaxed and happy and all us pug owners know that feeling when we pick up our pugs. King George V is grandfather to our Queen and was the King during World War I, who had a very strict Victorian upbringing but here he lets the stiff upper lip relax. 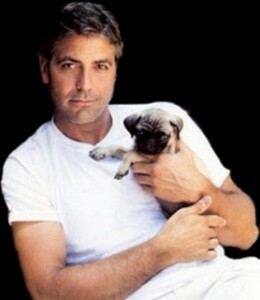 Below are other celebrities and their pugs. Paris Hilton and her pug, who looks like hes wallowing in the attention. George Clonney He is NOT the most handsome guy in this picture! One of my favourites Kelly Osbourne from a family of dog lovers has a pug of her own and is often photographed with it going to dinner dates and press engagements. 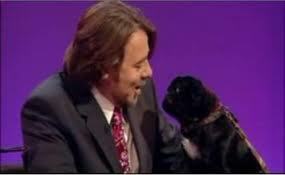 Again pugs love nothing more than the company of their owner and are happy to sit quietly in a restaurant, so these celebrities can get away with taking their pooches with them. Another Kelly – Kelly Brook and Jessica Alba who is holding a very pampered pug that needs to move more and eat less, like most of us. Hi it’s funny you should say your pug bites so does mine and sometimes we call her bite and if I want an adreline rush I play bite the bite with her. It’s really scary if she gets on top and goes for your face. We got a pug but you have to be very careful BECAUSE she bites!!! and scratches. And you want to hear her bark, shes really scarey. But I bloody well tell her! She sounds like a real guard dog – Hope you got a ‘WATCH OUT SHE BITES’ sign fixed to your gate.